Tired of flat, wet Illinois? There's a magical place with a tube hill, ice skating and snow... and we're not talkin' the North Pole. Just a little bit north of Chicago lies Frozemont and Polar Peak, a mini winter wonderland of active fun. My fearless girl rockin' the tube hill. Wish we had a GoPro. Dug, kickin' up some spray. 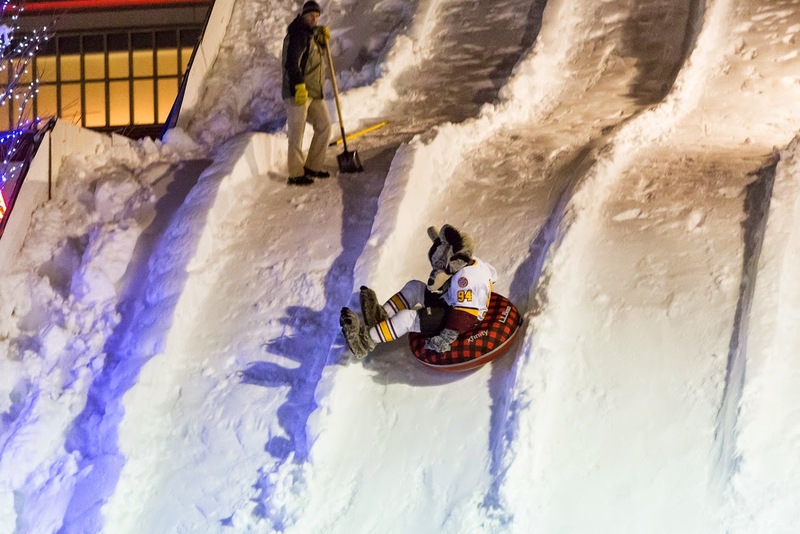 Even the Chicago Wolves mascot, Skates, got in on the tubing action. Check it out. We caught him on video! We had a blast with the new Polar Peak. It's a fast ride. The bottom of the track is a bit bumpy and jarring now, but I'm sure the texture will change as more people tube down and once we add real now to the mix. Also, just a FYI, we do have a friend who went so far at the bottom she hit the fence. She wasn't injured and was used to sledding, but it might be a deal breaker for the novice. That said, Frozemont is great, all ages fun. Just be sure you get the right boots back when you're done. Dad's got some big shoes to fill! Check out our full set of shots in the slideshow here and favorites embedded at the end of our feature. 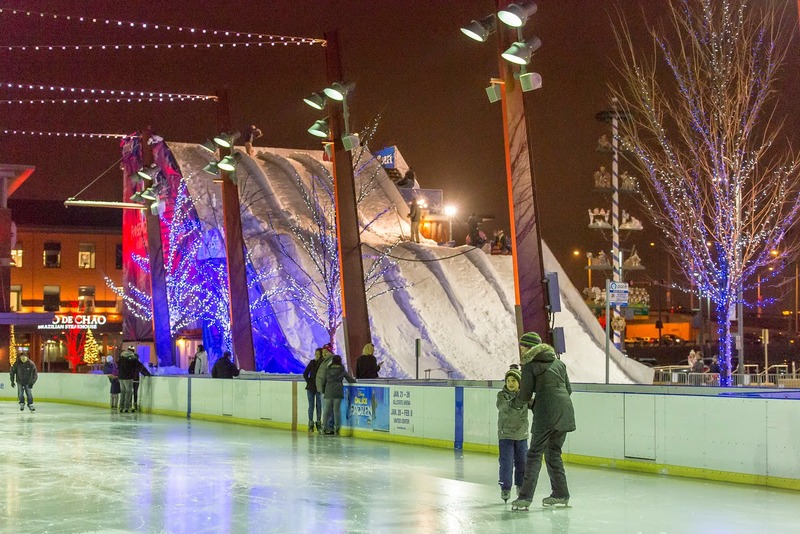 As snowflakes fall this winter, the Chicago area’s newest hotspot for winter fun is MB Financial Park at Rosemont’s FROZEMONT attraction, complete with winter tubing, ice skating, a hockey series and more fun for the whole family. 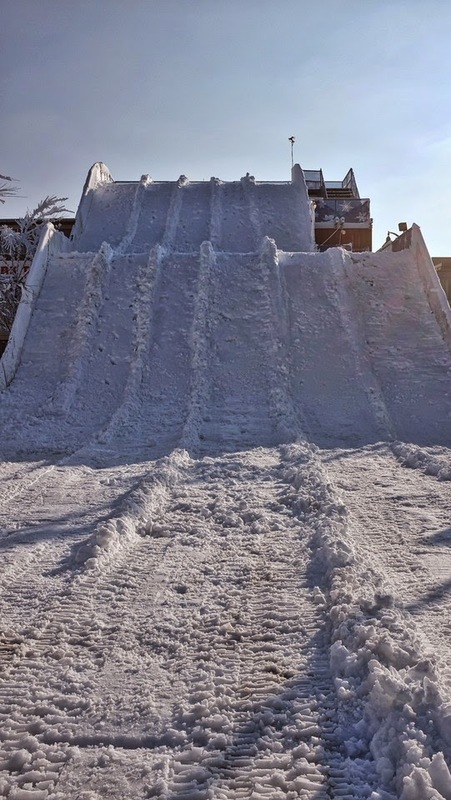 FROZEMONT’s centerpiece is the four-story “Polar Peak,” which will take visitors on a tubing thrill ride Dec. 12 – Jan. 19. Anyone seeking the ultimate snow tubing experience should look no further than Polar Peak’s 260-foot run which will send them racing down a steep grade. Sponsored by “Disney on Ice presents Frozen” and constructed in partnership with StackBox Structures, Polar Peak features five distinct lanes, include a less steep lane for younger children. Tickets for Polar Peak will go on sale at 10 a.m. Friday, Oct. 3. Tickets can be purchased online at www.mbparkatrosemont.com/frozemont or onsite for $20 per hour. Information on group rates, hours and more is available online. The excitement continues at Polar Peak with Shovel Racing and a Sled Box Derby scheduled for Dec. 27 and 28. More details regarding these events will be announced at a later date. 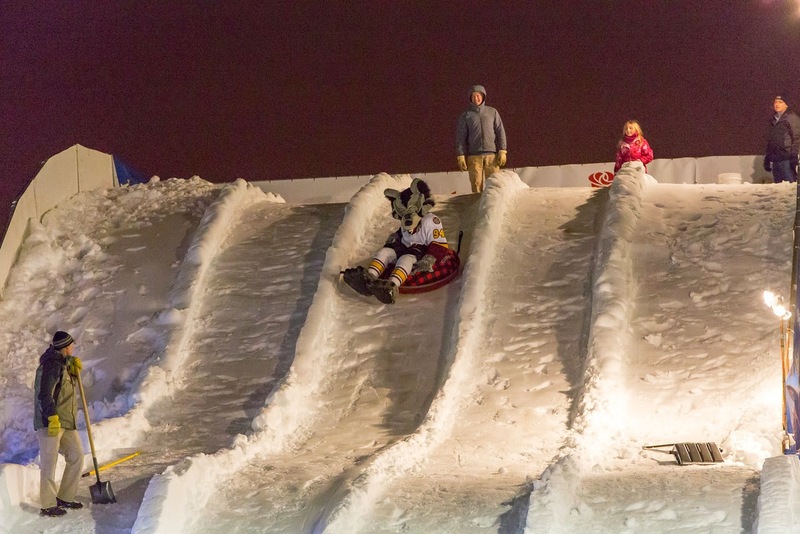 For the past three years, one of MB Financial Park’s most popular winter attractions has been its NHL- sized ice rink. Surrounded by a dazzling display of glittering lights, the rink opens to the public for free Skating in the Park. Other FROZEMONT winter festivities include the Winter Frost Face Off hockey series. The series will return to MB Financial Park for a second season to bring together kids, adults, and local Chicago hockey professionals to participate in a series of hockey games and competitions from Jan. 9 through March 1. A complete schedule of games will be announced at a later date. We ran into old friends Amy B. and Chiara of the blog, Amy Writes. We were stuck in traffic so long coming out from Chicago during rush hour that we missed the press opening food at Sugar and I got literally the last inch of hot cocoa, but we had a great time anyway. Stop hibernating and check it out! Click here for hours and more details. Click here for the Polar Peak LIVE Feed Cam!